Results show a Tory flatline and the Lib Dems going into meltdown. 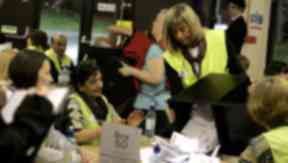 Count: Election workers sift through the ballots. Scottish politics is now a two-party contest after the SNP won the largest number of seats in the local election while Labour made gains and pulled off a defiant comeback in Glasgow. It was predicted as a rout but the outcome was more prosaic as the SNP advanced in some parts of the country and Labour made headway elsewhere. Labour regained its majority on Glasgow City Council, an unexpected turnaround and a bitter disappointment for the SNP which had set its sights on wresting the authority from a troubled Labour administration. Labour also won back Renfrewshire from the SNP. There was better news for the Nationalists in the form of majorities in Dundee and Angus. The Conservatives trailed in a distant third place but the Lib Dems went into meltdown. The tally of councillors is 424 for the SNP (up 61 on 2007), 394 for Labour (up 48), 115 for the Tories (down 28), 71 for the Liberal Democrats (down 95), 14 for the Greens (up 6), and 200 independents. The Edinburgh count took a bizarre turn when the Lib Dems were beaten by Professor Pongoo, an independent candidate dressed as a penguin. The party took 370 votes while the penguin took 444. The public went to the polls on Thursday but, in a change from previous years, the counting process did not begin until Friday morning. 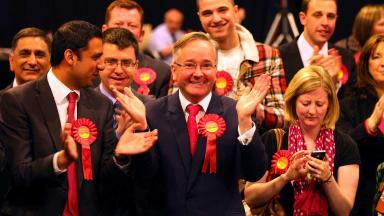 Labour has pulled off a shocking political comeback by regaining its majority on Glasgow City Council. Labour's total was 44, the SNP's 27, the Greens' five, and the Conservatives' one. 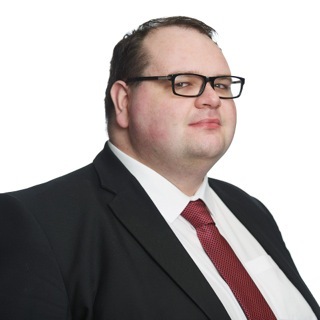 Labour breakaway party Glasgow First picked up one seat, as did an independent candidate. Renfrewshire was a gain for Labour. The party took 22 seats, the SNP 15, the Lib Dems one, the Conservatives one, and on independent. Labour is still in charge in Inverclyde with ten councillors against the SNP's six and the Lib Dems' two while the Tories and an independent took one apiece. The battle for East Dunbartonshire concluded with a neck-and-neck result that placed Labour and the SNP on eight each, the Lib Dems and independents both on three, and the Tories on two. Labour has no overall majority on West Dunbartonshire Council but it has twice the seats of its nearest rival. Labour are on twelve, the SNP six, and independents four. In North Lanarkshire, Labour was returned with an extra two seats, taking it to 41. The SNP gained six to take them to 26. Three independents were elected, down three on 2007. The Conservatives and Lib Dems were wiped out, each losing their sole councillor. Labour will not enjoy a majority in South Lanarkshire but it is the biggest party on the authority with 33 seats to the SNP's 28. Three Tories, two independents, and a Lib Dem join them. The final result for Argyll and Bute will not be known for another week after the death of a candidate. So far independents are on 13, followed by the SNP on 12, the Tories on four, and the Lib Dems also on four. The SNP have a one-seat advantage in North Ayrshire. The Nationalists have 12, Labour 11, independents six, and the Conservatives one. The Conservatives are still the largest party on South Ayrshire Council. The Tories scooped ten while the SNP and Labour tied for second place on nine. They are joined by two independents. The SNP has won East Ayrshire with 15 councillors to Labour's 14, the Tories' two, and one for an independent. The Tories are the largest party on Scottish Borders Council with ten seats. The SNP and independents tied for second on 9 seats each with the Lib Dems trailing on six. In Dumfries and Galloway, Labour claimed 15 seats to the Tories' 14 and the SNP's ten. Seven independents were elected, as was one Lib Dem. Labour have taken minority control of Edinburgh City Council with 20 seats. The SNP won 18, the Conservatives 11, Greens six, and the Lib Dems three. Labour banked a narrow lead in East Lothian with 10 seats to the SNP's nine. The Tories won three and an independent won another seat. It another one-seat advantage for Labour in West Lothian; the party took 16 to the SNP's 15, the Conservatives' one, and one further independent. Midlothian is hung in deadlock, with the SNP and Labour both on eight, along with one Green and one independent councillor. Aberdeenshire's full results are in and the SNP has come out on top with 28 seats. They are followed by the Conservatives on 14, Lib Dems on 12, independents on 11, Labour on two, and the Greens on one. Aberdeen City Council's count ended with Labour in the lead on 17, the SNP second on 15, Lib Dems on five, Conservatives on three and independents on three. Moray Council is hung with the SNP and independents both taking 10 seats, Labour three, and the Tories three. The SNP have failed in their ambition to make inroads into the councils of Highlands and Islands. Voters to Highland Council have elected 33 independents, 21 Nationalists, 14 Lib Dems, and eight Labour councillors. All 21 seats on Orkney Council remain in the hands of independents. Na h-Eileanan Siar (Western Isles) proved similarly disappointing for the SNP. Independents won 21 seats against the Nationalists' seven. Labour returned three councillors. Shetland also re-elected a council of 22 independents. Dundee City Council now has a majority administration. The SNP took 16 seats+-, with Labour next on 10, the Conservatives, Lib Dems, and independent on one apiece. The SNP are the largest party in Perth and Kinross. The Nationalists are on 18, Conservatives 10, Lib Dems five, Labour four, and independent four. Labour dominates Fife Council with 35 councillors. They will be joined by 26 Nationalists, ten Lib Dems, four independents, and three Tories. Angus is a win for the SNP, although they have only a plurality rather than a majority. The party clocked up 15 seats, followed by eight for independents, four for the Tories, one for Labour, and one for the Lib Dems. Stirling's results tallied with a narrow advantage for the SNP on nine seats and Labour on eight. The Tories took four and the Greens one. Labour pipped the SNP to become the largest party on Falkirk Council. Voters returned 14 Labour councillors, 13 Nationalists, three independents, and two Tories. Clackmannanshire is another draw. Labour and the Nationalists both have eight alongside on Conservative and on independent. The elections were conducted using the single transferable vote, a proportional system that aims to make seat allocation more reflective of vote share.